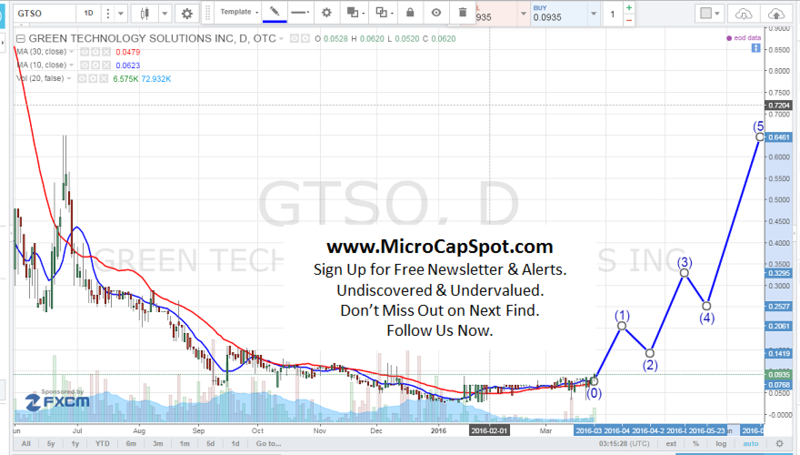 Green Technology Solutions Inc (OTCMKTS:GTSO) investors have reason to be excited given the powerful stock chart and the stock reaching levels not seen since December of 2015. The stock has tripled since the beginning of the year climbing from $0.03 to $0.0935. The stock closed up almost 7% at the end of trading day on 4x average volume. Over 100,000 shares traded hands which is a bullish indicator especially as the stock continues to climb higher. Many marijuana/cannabis related stocks have seen huge rallies since the beginning of the month when a report was issued about the rapidly growing industry and how it is poised to reach $44 billion in the next few years. Many cannabis stocks have been trading near or at record lows or 52-week lows and severely depressed. An even more impressive is that many of the stocks have been posted huge growth in terms of revenues and profitability. In recent news and developments, GTSO has been expanding into new businesses. Since the marijuana industry is growing at exponential rates and legalization is becoming a widespread trend across the United States, it has decided to pursue business opportunities in these areas. The company announced that it is partnering with a 3D printing company to create child proof cannabis containers. Essentially, it will be an attractive and affordable new solutions to keeping cannabis medication safely out of children’s reach. GTSO was in early stages of developing prototypes and what will work best. It had been experimenting with several designs including the latest is a Lock Box that has a sliding lid mechanism requiring adult strength to use. The company recently announced that it had finalized its design, sizes, and materials. It is moving forward with fully scalable, locking container capable of being produced in sizes suitable for key-chains, bookshelves or anything in between. GTSO plans to launch its first child-safe product in early 2016 in order to capitalize on the historic growth of the medical and adult-use cannabis markets in the U.S. and Canada. GTSO is currently trading at a $1.12 million market valuation. The has finalized its product design and ready to go into full scale production . It remains seen to whether its product will gain traction but it will likely get a lift if cannabis related stocks continue to rally. We will be updating on GTSO when more details emerge so make sure you are subscribed to Microcapspot so you know what’s going on with GTSO. Disclosure: we hold no position in GTSO either long or short at the publication of this article and we have not been compensated for this article. Where is PURE ENERGY MINERA COM NPV (OTCMKTS:HMGLF) Headed?